Made from PVC of superior quality. PVC Hand Gloves (Supported) Cotton Lining inside, Best Quality gloves designed to give maximum resistance against Acid and Alkali's, Oil, fat fuel,Printing inks, Inorganic Salts, Dyes, bleaching agent Abrasive material, Steam And grease. 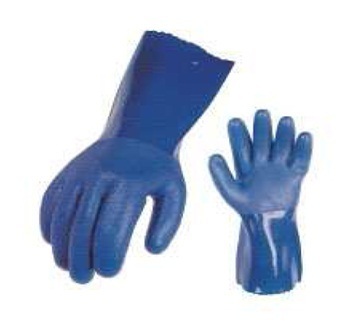 Used while handling Acid / Alkali and concentrated chemicals. Founded in the year 2012, at Vadodara (Gujarat, India), we “Darshan Enterprises” are a Sole Proprietorship firm, engaged in Distributing, Trading and supplying the best quality range of Face Protection Shield, Eye Protection Goggles, Fire Protection Equipment, Protection Mask, Road Safety Product, Safety Hand Glove, Protection Helmet, Safety Shoe, Safety Body Suit, etc. These safety equipments are sourced from trustworthy market vendors. We sell these products under the brand name Life care, Viraj Kawach, etc. Under the leadership of, “Mr. Virendra Jain” (Proprietor), we have been able to provide maximum satisfaction to our clients.